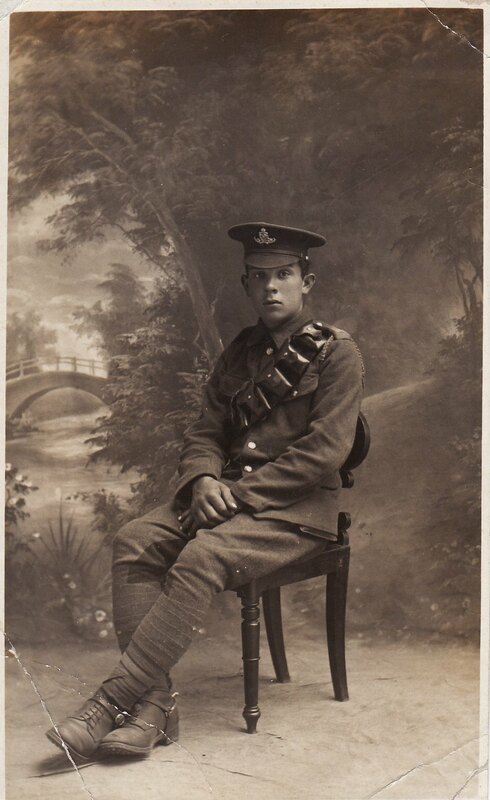 Purton boy, Louis Gough was discharged from the army aged 17 years and 11 days because he was discovered to have joined up underage two years earlier. Louis enlisted into the Royal Field Artillery in September 1914 at the age of just 15 years, 4 months and 5 days. He arrived in France on 31 July 1915 aged 16 years 2 months and 17 days. From his given age on enlistment, the Army believed him to be 19 years of age when he sailed to war. Louis was described upon discharge as a “bright, intelligent, willing lad who had the pluck to enlist aged 15 years”. He served overseas for seven months and was lucky to live to tell the tale. Louis Walter Gough is remembered on the Imperial War Museum’s Lives of the First World War digital memorial here. The following research has been compiled by Purton based military historian, Bob Lloyd. Enlisted: (Short Service, 3 years with the colours, 9 in reserve) 07/09/1914, Devizes. Age given: 18 years 120 days. Actual age 15 years, 4 months and 5 days, born Clyffe Pypard 02/05/1899. Address / Next Of Kin, family details: NOK Walter and Emily Gough (Father and Mother), Institute, Purton. MIC details / Medal entitlement. British War Medal, Victory Medal, 15 Star. 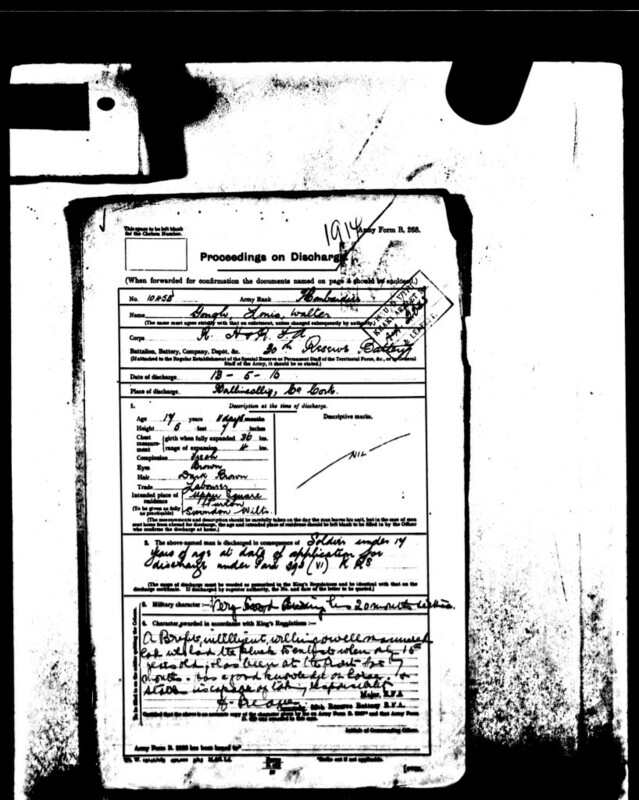 MIC records his underage discharge (A/Bdr) 13/06/1916. On Enlistment recorded his wish to serve with The Royal Regiment of Artillery. 18/04/1915 Posted to 37th Divisional Artillery. 31/07/1915 Arrived Le-Havre (detail from MIC) aged 16 years 2 months 17 days. From his given age on enlistment the Army believed him to be 19 years of age. 24/08/1915 Admitted 22ndGeneral Hospital with a Hernia. 21/09/1915 Discharged from 22nd General Hospital, re-admitted Hospital, Hernia, No7 CCS, discharged from Hospital to convalescent Depot. 16/10/1915 No2 General Base Depot from 125th Brigade RFA. 30/10/1915 Posted 29th Brigade, 4th Division. 03/11/1915 Posted 125th Battery, 07/11/1915 posted 120th Battery. 08/02/1916 Le Havre, No2 Base Depot. 09/02/1916 Home, 30th reserve Battery, Ballincolig, Cork. 13/05/1916 Discharged, under the age of 17 years at enlistment. Age on discharge was 17 years and 11 days. His character awarded on discharge describes Louis as a “bright, intelligent, willing lad who had the pluck to enlist aged 15 years, has been at the front for 7 months”.Evidence for inclusion on the Purton Parish list: Name listed in the Memorial book in St Mary’s Church (125th Battalion RFA), National Archive details (Service records), 1918 voters list for Purton Parish (HO) Institute. Records tell us that Louis went on to marry Daisy Richens in 1923, at Witney, Oxfordshire. There are no military records suggesting Louis fought in WW2, but we do know that he became a resident of Oxfordshire and died there, aged 78 in 1977.